The patella is the medical term for the kneecap. 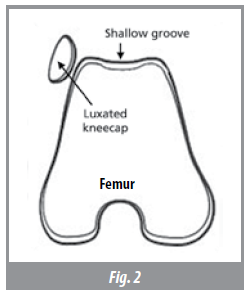 Luxation means that the kneecap dislocates or moves out of its normal position. A medial patella luxation (MPL) occurs when the kneecap moves out of its normal position toward the inside of the leg. 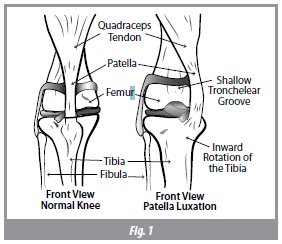 Less common is the lateral patella luxation, which is when the kneecap moves toward the outside of the leg. The patella normally sits in a deep groove located at the end of the femur (thigh bone). It glides smoothly over the cartilage within the groove during knee movement. In patients with patella luxation, this groove is usually too shallow – allowing the kneecap to “pop out.” Luxation can worsen and increase in frequency over time due to constant dislocation. The great majority of patella luxations develop as pets grow. In many breeds, it is considered a genetic or inherited trait. Most patients will have patella luxation by the time they reach maturity, but may not develop signs of problems until later in life. Below we will answer some frequently asked questions about patellar laxations in dogs. How Do We Surgically Repair a Patella Luxation? There are four steps to repairing a luxated patella. Each patient is different. Your pet may require some or all of the steps for correction. The surgeon will discuss their plan for your pet and the specific steps required. Medial desmotomy: This step loosens the tissue on the side of the knee that is too tight and contributes to pulling the kneecap out of place. Lateral imbrication: This step tightens the loose tissue on the side of the knee to help keep the kneecap in the groove. Deepening of the shallow groove (Fig. 2) is achieved by surgically reshaping the width and depth of the groove using special instruments. 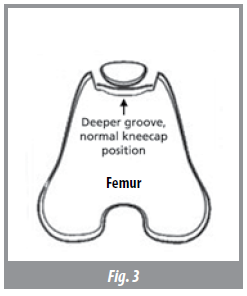 This allows the patella to rest deeply within the groove and move appropriately during knee movement (Fig. 3). 4. Tibial tuberosity transposition is achieved by separating the bone to which the patella attaches from its present position. It is then moved to a new position and maintained in its new placement with bone pins. The new location keeps the tendon in proper place to prevent luxation. What is the Success Rate of Patellar Laxation Surgeries in Dogs? We define success as a dramatic improvement in limb function, permanent relocation of the patella, and return to normal or near normal activity. This is expected in >90% of patients. What are the Potential Complications with Patellar Luxation Surgeries? The complication rate for these procedures is low. Infections uncommonly develop and when they do, usually resolve completely with proper treatment. Rare complications include pin breakage and migration. Anesthesia carries only a small risk of complications. In any patient, young or old, healthy or unhealthy, problems can arise. At MedVet we take many precautions to make anesthesia as safe as possible. We use the same drugs and monitoring equipment that are used in humans. We employ very experienced doctors and technicians who anesthetize thousands of patients each year with very few unexpected results. MedVet is one of the few private practice hospitals to have a board certified anesthesiologist on staff. This greatly improves the quality and safety of anesthesia. If your pet has any medical conditions such as heart murmurs, kidney disease, breathing difficulties or liver disease, please be sure to discuss these pre­existing conditions with your surgeon so that appropriate steps can be taken to ensure safety with anesthesia for your pet. No. Your pet must be evaluated before surgery. This entails a complete medical history, physical examination and discussion of the procedure. Preoperative blood work may also be performed depending on your dog’s age and health. What is Aftercare Like following Some Basic rehabilitation Exercises Surgery? The majority of postoperative care involves restriction of your dog’s activity. For the first six weeks after surgery, your dog is allowed certain at-home activities. Leash walks are progressively increased. No off-leash activities are allowed. Inside the house, your pet should avoid flights of stairs and slippery floors. No running, jumping or playing is allowed for the first six weeks after surgery. When your dog is not under your direct control, he/she should be confined to a small room, cage, or crate. All postoperative restrictions are discussed in detail and written down for you at the time of your dog’s discharge from MedVet. While the patella luxation correction surgery will make your dog’s knee more functional again, it is incomplete without proper postoperative rehabilitation. Any knee disorder can result in muscle atrophy, joint scar tissue, arthritis, and reduced joint range-of-motion. Physical rehabilitation helps to reverse these changes and return the leg back to pre-injury function. When your dog is discharged from MedVet, some basic rehabilitation exercises will be illustrated for you. More intensive physical rehabilitation, such as swimming and aquatic treadmill, is also available and should greatly enhance your dog’s recovery. Please refer to the Rehabilitation brochure for more details. If possible, we prefer to re-evaluate our patients at MedVet. Typically, only a six-week postoperative re-evaluation is required to ensure recovery is proceeding appropriately. Patients may develop arthritis due to the abnormal rubbing of the cartilage as the patella moves in and out of place. Surgical intervention may be the best way to limit the progression of arthritis over time. Once the patella luxation repair is performed and the instability resolved, markedly improved knee function and comfort is expected even in the presence of established arthritis. Continued limb dysfunction is expected. Generally, once a patient begins to show signs of knee dysfunction, these signs will progress. A progressive loss of limb function, muscle loss, and worsened grade of luxation will occur. Both of my Dog’s Knees Have Patella Luxations; Can Both be Operated on at the Same Time? In the majority of patients with patella luxation, both knees are involved. If both knees are problematic, depending on the size of your dog, it may be possible to repair both at the same time. This quickens the overall recovery and is less expensive than staged procedures. We may elect to stagger surgeries in larger dogs to avoid the potential for health complications. Do the Pins Need to be Removed if a Tibial Tuberosity Transposition is Performed? Once the bone has healed, the pin’s job is done. However, because the implants rarely cause problems, routine removal is not recommended. If removal becomes necessary due to signs of infection or irritation, it is a minor outpatient procedure. Can my Dog Re-injure the Same Knee? Re-injury after a patella repair has healed is uncommon. Rarely, dogs will require a second surgery to correct recurrent patella luxation. This is reported to occur in less than 6% of patients.